AP Police Constable Hall Tickets 2019: Andhra Pradesh State Police Recruitment Board (APSLPRB) has released police constable Final written test hall tickets 2019 at slprb.ap.gov.in. To attend the test, the aspirants have to get ready with a good preparation. This year a larger number of candidates are going to take part in the written test round for AP Police Constable, SI posts. Hence, the competitors must prepare well to crack the written test. The APSLPRB will be conduct the preliminary examination for Postcodes: 11-16 on 16th December, Paper-I from 10.00 AM to 01.00 PM (3 hours) and Paper-II from 02.30 PM to 05.30 PM on the same day. The APSLPRB is going to organize the Final written test on 17th March 2019. Aspirants applied for the APSLPRB Constable and SI posts must note that the hall ticket/admit card is the key document that is needed to be taken to the examination. As per the notification, the APSLPRB Police Constable admit card 2019 will be accessible to download before 10 days of the examination (notification states). Candidates applied for APSLPRB Constable, SI posts can visit the official portal, slprb.ap.gov.in to download the hall tickets. The hall ticket/admit card link will be activated on the homepage at the time of its release. Simply, by clicking on it, applicants can avail their hall tickets. Andhra Pradesh State Police Recruitment Board (APSLPRB) is the police recruitment board that carries out the police posts in the state of Andhra Pradesh. The organization annually announces various posts to recruit the suitable aspirants into police jobs in AP state. The organization announced 3137 posts this year. Aspirants wishing to become police constable in the state of AP has applied from 5th November and 24th November. Hopefuls need to qualify the AP Police Constable written test, PET, PST, and interview rounds to get the AP Police Constable posts. Previously, the organization is going to conduct the preliminary examination for the applicants in December/January months. 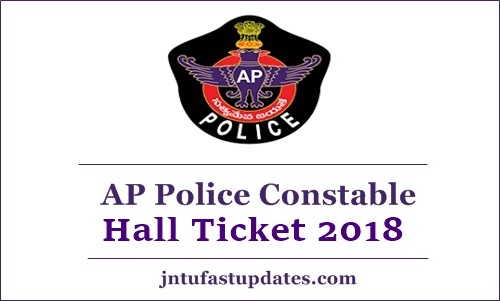 AP Police Constable Hall Tickets 2019 – Important Details. Candidates applied for constable, SI, ASI, Fireman and other posts need to qualify various rounds of selection process. Candidates qualifying all these rounds with good merit will be finally appointed in AP Police Department jobs. Candidates applied for the posts have to qualify the 1600 Meters run (L Mile Run) and also the following rounds are given below. Candidates appearing the prelims examination must carry blue/black pen while going to the test. Do not forget to carry the hall ticket and identity proof while going to the test. Report 30 minutes before the examination time. On the homepage, the hall ticket download link will be active when the authority releases the hall tickets. Click on the link; and provide the needed user credentials. Tap on the ‘Download/Get Hall ticket’ button. Verify all the details clearly and take a printout of it.